That GPU is connected to a massive, 17.3-inch, integrated display that has a 4K (3840x2160) resolution and an anti-glare coating that I am very pleased they decided to add. The screen looks AMAZING and, with Windows 10 improving on scaling text, the experience out of the box is solid. The screen is built with IPS technology so you’ll get great color reproduction and viewing angles. It does NOT including G-Sync variable refresh rate technology though – that is coming in another SC17 model later in the year. One thing you’ll have to balance, with a 4K screen at a GTX 980M GPU, is game resolutions; you won’t be able to play Rise of the Tomb Raider or Grand Theft Auto V at 4K. But playing at 1080p and scaling that up to the monitor works great though. Rounding out the features, you have 32GB of memory and a 256GB Samsung 950 Pro NVMe SSD to really help keep things moving on the system. EVGA includes a 1TB 7200 RPM hard drive for mass storage. You have Gigabit Ethernet, 802.11ac dual-band Wi-Fi, Bluetooth 4.2 and some impressive integrated speakers with a dedicated subwoofer as well. Connectivity includes two USB 3.0 ports, a single USB 3.1 Type-C connector (not for charging), a full-size HDMI 1.4, dual mini DisplayPort (one of which can run external G-Sync monitors) and a headphone/mic audio jack. The hardware encompassed by the SC17 is impressive, but it takes more than just a solid spec sheet to get gamers interested in a mobile gaming configuration. EVGA spent a considerable amount of time designing its first gaming notebook to be sleek (as sleek as it can be) and added cool touches throughout. The EVGA SC17 is a surprisingly good looking gaming notebook, more in line with modern designs than many of the other very popular gaming brands on the market. It’s still big, and still pretty heavy, but gamers willing to invest in a $2699 gaming notebook with a 17-inch screen should expect those traits for the foreseeable future. The SC17 is big – measuring 16 inches wide by 11.6 inches long. The all-important z-height, or thickness, is just 1.05 inches, an impressive characteristic when we compare it to something like the MSI GT72S that measures in at 1.8 inches thick. It’s heavy at 8 lbs. and 11 oz., not including the power adapter, so you will feel it in your backpack. From a design perspective, I really have fallen for the SC17. It’s black with a semi-matte finish all the way around and it's understated. There is just the right combination of angles and corners to make it seem aggressive without being obnoxious. The all metal body gives it a feeling of value and luxury that plastic chassis won’t be able to match and is somewhere between the Apple and Razer notebooks for first glance quality. The right hand side of the device includes two USB 3.0 ports and the Type-C USB 3.1 port, along with a headphone jack. On the left, you’ll find your power input, a Gigabit Ethernet port, full-sized HDMI connection and two mini DisplayPorts. One of those mDP will support an external G-Sync monitor, so, if you want to game on a different display at home, you have all options available to you. I’m a bit confused as to why you couldn’t run G-Sync on either or both mDP connections, since you can utilize them all simultaneously for NVIDIA Surround support. The back panel has an EVGA logo that is individually lit with its own LED light – it does not use the backlight from the screen itself. This allows you to turn it on or off independently in software depending on preference. EVGA tweaked the design on the lid of the SC17, allowing it to be opened with a single hand without causing the base of the notebook to lift off the surface it’s resting on. The motion is smooth and consistent throughout the arc of the display; it’s a little thing really but it adds to the feeling of quality that you don’t find in many notebooks. Once you crack open that screen you are met with a combination of goods that will impress any gamer and enthusiast. That 17.3-inch 4K screen is fantastic looking. It loses just a bit of clarity with the matte finish applied over it but I would gladly trade off the added sharpness of a glossy screen for the lower reflectivity that EVGA has built into the SC17. The bezel around the screen isn’t thin like a Dell XPS 13, and seems bigger than necessary at the bottom, but these are tradeoffs EVGA makes when designing the rest of the chassis to fit the necessary components and cooling capability for the hardware. Along the hinge of the screen is the area where hot air exhausts from the machine during gameplay. That metal surface definitely got hot to the touch in my testing, and it would be uncomfortable to have to put any skin on it – but that heat up doesn’t happen to the wrist rest area at the bottom of the notebook. The power button lights up when you first turn the machine on, but the white LED fades soon after so as not to annoy you while gaming or surfing. That little hole above the power button? That is a BIOS reset switch in case you overclocking your notebook a bit too hard. Cool!! The keyboard on the SC17 is a full size design with a number pad integrated as well. The distance of key travel is better than on nearly any other gaming notebook I have used, with the exception of that massive MSI GT80 with the Cherry switches. It has a good mix of required pressure to depress the keys and travel once you cross the scissor switch threshold. I typed a good amount of this review on the SC17 keyboard and found that I quickly adapted to it. I could very easily write with it for extended periods. Key placement is pretty standard and the adjustable white backlight means you can use it in the dark. One nice touch – the arrow keys double as automatic overclocking profile adjustment through the EVGA Prevision X Mobile software. The touchpad integration is decent, bypassing the trend of full pad click capability for a design that uses the bottom of the touchpad for the buttons. It works well and I had no issues with it, but it didn’t stand out as a great addition either. It was a bit too mushy for my preference, but some users might lean in that direction. For a notebook this size, I would also like to see the touchpad be a little bigger. Integrated speakers on notebooks are always a tradeoff. On the SC17, EVGA has invested in a dual speakers on the top of the chassis wrist rest and included a subwoofer on the bottom. Overall, it sounds good, and it will work for gamers in a pinch, but we all know that speakers or headphones are the way to go for serious gaming or multimedia consumption. For a first offering in the gaming notebook world, the EVGA SC17 presents a great first impression, both in hardware specifications and design. But can it live up to its own standards in performance? it's sad that at the price due to the 980m this is not going to be VR ready... I guess it's going to be capable but not fully 100% vr ready. 980m has 8gb of memory. it's completely VR ready. Considering new mobile GPU's are coming this summer, it's a bit silly to make totally new product based on old tech at this point. And for the price, it looks totally boring too. It's a machine that makes no sense at all. What were they thinking??? No offence, but you're the one not making sense. Yes the new GPU's are coming soon, but this laptop has been in development for a long time, they had to release it. And there will most likely be a revision with the new GPU's when the time comes. Also what you call "boring", I call classy. Its a laptop you can pull out at a business meeting without looking like a clown. Unlike most other "14yo G4M3R" style gaming laptops. As for the price, its perfectly adequate considering the competition. It is a really nice laptop for sure, but it just doesn't make sense to me to get a laptop that can't connect to, and/or isn't compatible with an eGPU. Perhaps evga has eGPU compatible laptops and eGPU boxes in the works? as far as I can tell, it doesn't have TB so it is not compatible with an eGPU. The eGPU does not defeat the laptop as a portable device. You can do many things with a laptop besides gaming, such as read emails, work on a spread sheet, etc. You dock the laptop at home when you are ready to use that desktop performance GPU. You are missing the bigger picture here, upgrade-ability and more GPU horsepower when needed. Now, if this evga laptop had the capability to be hooked up to an eGPU and had the 980m built in? yes, please! I think there are better options. The 980m is good, but no where near enough for 4K. The 4K screen and 8GB VRAM are good marketing points and little more. For that price, I'm pretty sure you can get 980m with a 1080 G-Sync panel and a Thunderbolt 3 USB Type C port. I would rather have tech that is actually useful rather than tech that's just thrown in to check some bullets on the marketing. In my opinion, high ppi displays are most useful for having clear text. I have gotten used to having high ppi on phones and tablets, so I definitely would like to have it in a laptop screen also. I have been waiting for 4K in a 17 inch screen, but at this point I would also like to have VRR. I think I will wait for VRR support and probably a 14 nm GPU before spending that large amount of money. Oh, I am afraid your comments are too noob. Dell's near borderless/infinity edge display/bezel for that matter is a result of having no dedicated number pad on the right side of the keyboard. This was already explained by different manufacturers that if you have a full-sized keyboard in your laptop your display panel size has to match up and hence the excessive 'extra' bezels. Notice the XPS 13 and XPS 15 do not have numeric keypads on the right side compared to EVGA's SC 17. Maybe somewhere down the road they will eventually find a solution for this though. Pretty brilliant of Dell though, you delete components making your product cheaper to manufacture. Then market your gimped product to the "Ooo! New & Shiny!" buyer as being "innovative." Anytime you can get consumers to rationalize a premium price for simply leaving stuff out of your product, your marketing department is getting it done. Missing thunderbolt 3. Guess ill have to get that lenovo thinkpad P70 or HP Zbook 17 G3 i need external GPU, having a single machine to do both work and play is much convenient than switch to a desktop pc. Ryan can you please please please start telling your audience if the GPU's are MXM modules in your laptop reviews. Also if the CPU are socketed or disposable BGA rubbish. Main reason. Upgrade-ability. Yes it's finicky to do in a laptop, but my community and I often do it. Some of the Sager/Clevo's are especially upgrade friendly and appeal massively to enthusiasts who for whatever reason can't have a desktop. Having a laptop that's upgrade friendly is something I think we should be pushing when we're spending $3k+ and MXMb modules have been the standard for half decade. It's ridiculous to otherwise have to throw the whole laptop out if it breaks out of warranty or we want to upgrade refresh the GPU because all the components are locked down and soldered in. Hi, I agree with the points made by tbonesan who posted earlier: would be interesting to know if this laptop has BGA CPU, and if the GPU is MXM - primarily for upgrade reasons, especially the GPU. I like the more enthusiast orientated BIOS in this laptop, but it's a bit late in the day for a laptop based on Maxwell - Pascal is on the doorstep! TBoneSan raises a very important argument. These new B.G.A. systems, which are essentially one large board soldered components, are not a step forward in bringing consumers newer offerings and a better experience in getting closer to the desktop enthusiast's experience. These machines are a mediocre compromise masking something far more unnerving in terms of the drastic steps taken back in the design philosophy. Desktop enthusiasts would not tolerate such a shift and constriction in what they can do with their machines, and as such, there is no rational or logical reason why laptop gamers shouldn't have similar expectations and standards, especially with the great strides that have been made with laptop component accessibility over the course of the last 10 years. This regressive development isn’t good for consumers or what laptop gaming should’ve ideally been about when it comes to the interests of consumers as well as an industry that is meant to compete with smarter, practical and competitive design choices. Therefore, we earnestly implore you to be among the few outlets to give this point the worthwhile exposure it needs – be the frontrunners in taking a stand on an issue that happens to speak for both better hardware design practices, as well as pro-consumer advocacy. Desktop class computing capability to a notebook... What is this??? A joke? Only A new BGA machine like any other, just in a prettier package. First unlocked processors from Intel for mobile computing - multipliers and voltages can all be tweaked in the UEFI or through Precision X Mobile software two push it even further... Even a new joke. Older Aw / Clevo gaming laptops overclocked nice to +4.5GHz. How high Overclock on this? Up to 4.1 GHz? Yeah.This is barely the same as a desktop i7. What a joke. Buy an expensive BGA machine that soon has completely outdated hardware(Gx980m is nearly 1.5 year old). What with VR? Is Gtx980M a recommended graphics card for VR? Of course not. Even a big joke. I recommend people to buy a lot cheaper BGA machine than this if you absolutely must have one. Not an overpriced slim case such as this. You are completely stuck with a BGA machine. Forget upgrade if you want this. As said. This is yet another BGA machine like all other. Steer clear of this if you want desktop performance in a laptop. How much it cost me? A fraction of what this new machine costs and you wont see any thermal throttling in a properly build enthusiast laptop with socketed cpu and replaceable gpu. With such a slim shell that soldered 980M will either heavily throttle or not be able to run at any kind of boost clock speed allowed an old machine with the same card in MXM form to run circles around it. Please no more of such overpriced, gimicky, badly built rubbish. Treat consumers with the respect they deserve. Well considering all the responses related to the BGA machines, I concur to all those opinions which are true. Yesterday I noticed the EVGA machine is coming out and within few minutes all the excitement was drained, the low profile motherboard and small fans to cool a powerful hardware with OC support (BGA hardware necessarily throttles with power limits due to soldering),the BIOS is a great step forward but the hardware used is a generation back. Considering the price tag, We can get a P7xxDM series with much better modularity and upgradeability with the Custom BIOS mods that's a true enthusiast machine. As notebookcheck offers the note of BGA or MXM modules in their reviews that should help many consumers know they are not being ripped off, Please consider to include the hardware interfaces if you are reviewing a machine with "High Performance" "OC" tags. Thin soldered BGA laptops do 1 thing well, they overheat! This will be no different... You can have many features however the thinness will mean that it will overheat and the fans can't keep everything cool. Now a Clevo laptop like the P771DM or P771ZM(which is now 1 year old), is slightly thicker however the bigger chassis allows a the socketed desktop CPU like a 4790K to run cool along with the non-soldered MXM GPU.. My 4790K trumps anything in this and actually is able to hold a 4.3GHz (on 4 cores) clock in games... The non-soldered GPU means that if your GPU fails you don't have to buy a new motherboard but just replace the module.. I can also upgrade my GPU down the road if I want.. Soldered BGA hardware doesn't allow this. Just to echo Ashtr1x says, it would be good to identify if the hardware is BGA or not so that consumers can know if they are being or not being ripped off and to also to echo his 2nd point, please include the hardware interfaces in these laptops! i was a bit disappointed. although in general PCPER reviews were great and detailed. as an enthusiast in mobile hardware, this doesn't talk about much and I find it surprising. to start, a thin laptop like this mostly come with soldered parts, ram/SSD, majority cases RAM/SSD aren't if they are not apple however GPU is what people would want to know as we like to do future upgrades. giving the fact that 6820hk is used, it's already a BGA silicon which intel forced OEM to use it. another thing wasn't mentioned and I was hoping to see is that these crappy silicon even though they can still be overclocked, the power draw and heat they got is tremendous compare to others. lastly of course we got a single PSU thats probably no more than 240w, which isn't really capable of anything high end overclocking like 4.4ghz on cpu and +200mhz on GPU while supporting rest of the machine LCD/mobo. it'll also be nice ot see in future to check on if battery power are taken from the laptop while AC is connected during heavy load. Oh boy. So Tbonesan referred me to this article. Your review is a good bit one-sided. It's pushing that the machine is amazing, and cherry-picking points that sound good on paper without actually "reviewing" the laptop. You've basically done a glorified unboxing. This is not how one reviews a machine which cannot simply have better cooling tossed at it, or hardware upgraded (that CPU is soldered; and you made ZERO mention of whether or not the GPU was soldered too, though I suspect it is). Before I begin essentially... tearing you apart nicely... however, I must say: THE INTEL 6820HK IS NOT THE FIRST, OR EVEN ONE OF THE FIRST, UNLOCKED MOBILE PROCESSORS. THE i7s- 920XM, 940XM, 2920XM, 2940XM, 3920XM, 3940XM, 4930MX and 4940MX have existed for some five-odd years. Correct your statements please. Firstly, the 6820HK turbos to 3.2GHz under 4-core load. 3.6GHz is a FAR higher number, and SOLELY exists for 1-core load turbo. 3.4GHz is for 2-core load turbo. 3 and 4 cores hit a paltry 3.2GHz, nowhere near impressive out of the box, for the games that ACTUALLY use the CPU. You know, like GTA V, which you specifically mentioned in this article. And then you haven't even spoken about the maximum allowed overclock (that the BIOS/Intel XTU will allow), the maximum allowed power draw (because overclocking to 4GHz+ is kind of pointless if the firmware is going to TDP-lock you at about 65W), or how the cooling system handles the machine at stock and when overclocked. Speaking of the cooling system, you failed to mention how the 980M handles as well as the CPU. More importantly, if it keeps its turbo properly in all scenarios, and whether the machine is one of those that kills turbo boost for either the CPU or the GPU when both are being stressed... because those exist and are pretty common *cough* lenovo *cough* alienware *cough*. Also, what's the size of the power brick? This is an overclockable system, no? I'd like to know how much headroom I've got, and whether the brick is of good enough quality to support the rated deliverance, or if it simply covers draw from the wall (making larger numbers less reliable). Next, you neglected to mention whether or not the RAM actually ran at 2666MHz, and if it did, what the timings were... most RAM is 2133MHz CL15, and I know 2400MHz CL14 exists, but there's no reason that this RAM isn't say... 2666MHz CL17 or Cl18. You also neglected to mention whether the machine used Optimus or not, which is a HUGE deal for enthusiasts (which this machine should be targeted to). If you don't understand why Optimus is a huge deal and generally hated by enthusiasts, then you need to go do some more research before you're reviewing these kinds of laptops =D. Going further, I want to ask why you didn't mention the downside of only two USB ports? A third USB 3.1 type-C isn't compatible out of the box with most USB devices, so I'm not counting it even though an adapter can be purchased. By the time I plug in a headset and mouse I can't even use a controller? What kind of gaming-laptop design is that? And why the love for the 4K screen as well? Having to run games at non-native resolution is a real problem for many users because it simply does not look right. And if you're like me and you like windowed modes or borderless windowed for multitasking with second monitors plugged in while at home, you're going to be in even MORE trouble, because "just" 1080p will be tiny on the screen, but still will be a rather hard performer... assuming games even play nice with windowed mode. Battlefield 4 for example runs in 720p in windowed mode no matter what you try; it's going to be terrible. It's granted DICE's fault, but still, the screen is going to be more of a detriment to a GAMER than a benefit. Well, I'll stop here. I don't want the post to be TOO long. But I had to say what was on my mind. If it sounds like I've been absolutely bashing you, don't take it to heart. The next machine you review, if you included all that I mentioned (aka what I and many enthusiasts consider "doing it properly"), then I won't have this kind of comment again =D. So good luck, do improve, we need more people to improve. Oh dear... another attractive yet crippled BGA turdbook. So many comments have already been stated against this type of pathetic product So, I will merely offer my agreement with all who have already expressed their disgust with this Mickey Mouse jokebook. As long as Kool-Aid drinking compromisers are willing to blow cash on crippled BGA trash there will be a market for this disposable filth. If they would stop trying to pass it off as "high performance" it would not be so disturbing. The BGA CPU instantly disqualifies it as being a high quality product. If it also has a BGA GPU (which seems inescapable with such an unaccommodating profile) that is two strikes. Having 4K as the only option is strike three and the death blow. There is no way this machine is capable of delivering an impressive gaming experience a display resolution that warrants nothing less that overclocked 980M MXM SLI, an overclocked Titan or 980Ti to deliver a modest, yet playable, framerate. A single 980M is going to deliver, at best, little more than a slide show unless the lowest graphics settings are used along with a substantial GPU overclock. If a person is happy with a pathetic CPU and a 30 FPS gaming experience, a $500 Alienware Alpha or similarly priced console is a whole more intelligent based on price alone. actually, first intel unlocked mobile GPU is T7600G dual core oc to 3.16GHZ, then comes along x9000, x9100, QX and then 920xm which is first gen i7 etc. There are SO MANY professional reviewers that gloss over, ignore or even avoid disclosing all of the important things that every uninformed consumer deserves to know. 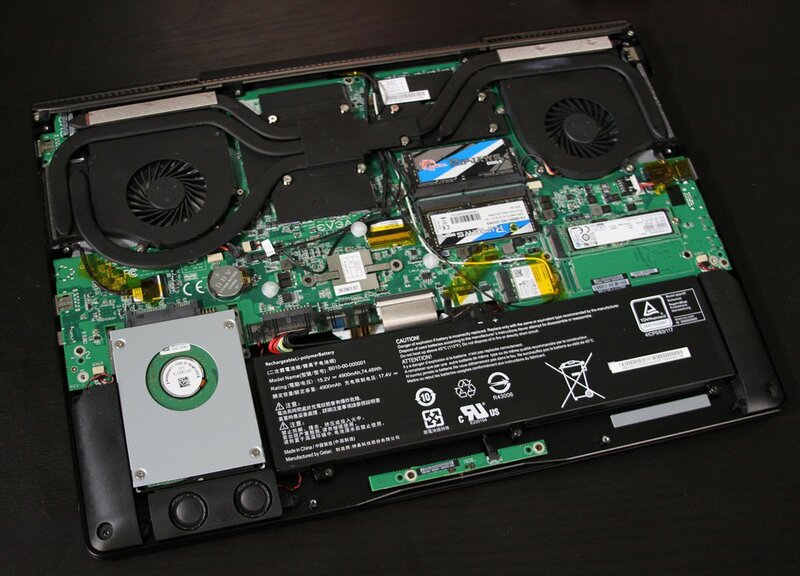 I think knowing and drawing attention to the fact that an expensive laptop has the CPU and/or GPU permanently soldered to the motherboard and cannot be effectively serviced, repaired or upgraded has potential to be a product killer. Such a flawed product deserves to fail. It would certainly the the right thing to do if reviewers everywhere highlighted such a fatal engineering flaw for their readers. When doctors and lawyers fail to give the right information to their customers it is medical and legal malpractice. When their involvement is negligent or technically incompetent or incomplete they are potentially liable for the bad decisions or circumstances that follow their involvement. Failing to expose and deride BGA "high performance" notebooks as being a scam and a sham seems to be an organized form of professional malpractice. We are reaching a point of critical mass with defective designs that have potential to ruin everyone's future. Those that hold themselves out as experts need to step up to the plate and bet their paycheck on doing the right thing and letting the chips fall where they may. When there is nothing for sale except trashbooks, we are all going to be in a world of hurt. We are almost there now. A very loud and clear message needs to be sent and unless the OEMs get punched in the face with a sledge hammer this kind of filth will be all that is left for anyone to buy. It is saddening really that the reviewer as you say seems only happy to paint a pretty picture of this laptop. I daresay EVGA paid pcper to write such a review as I cannnot believe a bunch of amateurs would be writing reviews for such an influential website. I can imagine the reviewer has a nice powerful desktop at home. Lets see what he writes when he gets to review a bga desktop! Not so prepared to gloss over the details then. What's more such support shown for bga only bring the desktop community closer to same poor choice of products that we notebook enthusiasts have to deal with now. Wake up everybody!! Before it is too late. The price is much too high considering many 980M laptops are now sub $2000. The processor is not going to make that much of a difference in gaming performance and people who are rendering would go for a Quadro GPU not a 980M. I just don't see the market for this especially with all that tech being long in the tooth. Maybe EVGA knows something I don't. It should at least have G-SYNC out of the box at that price point. Reading the comments on this 'review' was a hilarious experience, thanks everybody! That being said, I'll be in the market for a high performance gaming laptop soon, can anyone here recommend an offering that's actually half-decent?